Send international text messages with Voodoo SMS. Our international SMS gateway lets you send bulk text messages to UK phone numbers and recipients in other countries, all at highly competitive bulk SMS prices. With our international bulk SMS service, you can import your list of recipients and deliver your marketing message, customised alert or notification to international recipients via our UK short code number or your business's Virtual Mobile Number (VMN). Our user friendly online platform makes it easy to customise your SMS campaign and schedule delivery for the optimal time and date. With our volume-based pricing, you'll also spend less on each text message the more you send. Voodoo SMS is an online text messaging gateway that lets you send international texts via your web browser. There's no need to download and install software or purchase your own hardware to launch your SMS campaign. Our international SMS gateway lets you send several different types of message. You can send out an immediate broadcast to your audience, deliver dynamic SMS that contain custom names and other variables or schedule messages for automated delivery at a certain time and date. With our international SMS API, you can integrate text messaging into your mobile app, website or software using our code. Our SMS API modules provide support for widely used eCommerce platforms like Opencart, Magento, Shopify, WooCommerce and others. Send your text messages via Voodoo SMS is simple. After you create your free account, import your existing marketing list to create your campaign's audience. You can write and deliver your first text as an immediate broadcast or schedule it for delivery at a specific time and date. With Voodoo SMS, you can also schedule your message to deliver automatically in batches of a certain size. This delivery method gives your sales team or call centre a steady supply of leads to contact and close at your own pace. Our international SMS gateway supports a large number of regions and markets. 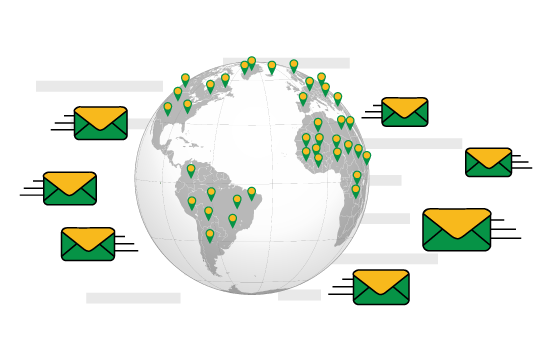 Currently, we support SMS to 250+ countries in Europe and beyond. You can choose to send your text messages using our UK-based short code or your long phone number. When you use our shortcode, recipients can respond using your custom promo code to contact your sales team and claim your marketing offer. When you send an international SMS campaign with Voodoo SMS, you'll get a full report on its performance. Our delivery reports track your campaign's send rate, response rate, bounce rate and other key performance indicators that you can use to measure and assess results. Our detailed reports make it easy for you to track and optimise your campaign performance over time to achieve the best return on investment from your SMS marketing. With our volume-based pricing, you'll pay less for each international text you send the more you deliver. Our domestic text message pricing starts from just 1.74p per message, with international texting rates from just 0.87p! As one of the UK's most trusted international SMS service providers, we help a diverse range of businesses achieve their marketing goals through SMS. Create your free account now and start contacting your prospects, customers and application users through international SMS.